An Energy Bill's Coming In July. But What Kind? Last Friday, Harry Reid sent a letter to various Senate committee chairmen telling them he wanted to get an energy bill rolling in July. BP's poisoning of the Gulf has apparently made energy reform look a lot more palatable than it did a few months ago. 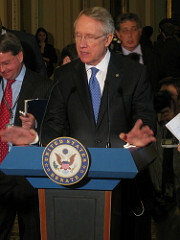 But Reid's letter was blurry on the details: He never said whether he wanted legislation that capped carbon emissions. An "energy bill," after all, could mean anything from the big Kerry-Lieberman climate bill to a scaled-down bill that just cracked down on oil companies and maybe added some funds for alternative energy sources. A more modest approach might give Dems a nice, tidy political win. But it wouldn't do nearly as much for the planet. And now it's starting to look like a smaller bill may, in fact, be in the offing. Earlier today, Chuck Schumer was on MSNBC and said that the legislation Reid was assembling would resemble the (weak) energy-only bill passed by Jeff Bingaman's committee back in June. In other words, there'd be some renewable-power mandates, some incentives for nuclear, some funds to kick-start new transmission lines, and some new regulations on oil companies. If Kerry and Lieberman want to tack on a cap-and-trade scheme on top of all that, Schumer said, they'll "get a chance to add it in the form of an amendment." If Schumer's right, this would certainly lower the odds that Congress will pass a carbon-pricing scheme this year. The logic behind combining everything into one big bill, as Kerry and Lieberman did, was so that the items that were popular with senators (like oil regulations or financial support for nuclear utilities) were mashed together with the unpopular items (cap-and-trade), and there'd be one big up-or-down vote on the whole enchilada. If energy and climate get separated out, then it's less likely the latter can survive. Another possible scenario is that the Senate passes a flurry of energy measures—renewable-power mandates, funds to boost efficiency, and the like—and then just lets the EPA go ahead and regulate carbon-dioxide on its own. But even that's not assured. This Thursday, Lisa Murkowski will put forward a "resolution of disapproval" that would strip the EPA of its authority over carbon. (In essence, her resolution would reverse the agency's scientific finding that greenhouse gases are a threat to public health.) Her resolution only needs 51 votes in the Senate, though it's not likely to survive both the House and an Obama veto. Still, it'll be a test to see if Democrats can protect the EPA's authority and keep Plan B intact in case a climate bill can't get done this year. Update: Looks like Kerry and Schumer are meeting later this week to hash out strategy.